We study sample-path large deviations for Lévy processes and random walks with heavy-tailed jump-size distributions that are of Weibull type. Our main results include an extended form of an LDP (large deviations principle) in the J1 topology, and a full LDP in the M′1 topology. The rate function can be represented as the solution of a quasi-variational problem. The sharpness and applicability of these results are illustrated by a counterexample proving non-existence of a full LDP in the J1 topology, and an application to the buildup of a large queue length in a queue with multiple servers. Bazhba, M, Blanchet, J, Rhee, C.H, & Zwart, A.P. (2017). 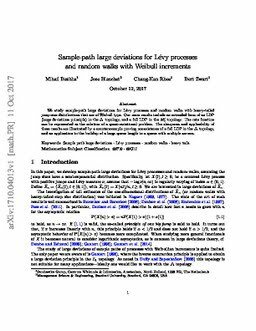 Sample-path large deviations for Lévy processes and random walks with Weibull increments.